I was really hooked on this show. It used play every day after I came from school and I would always watch it. This cartoon was about a racer named Speed. 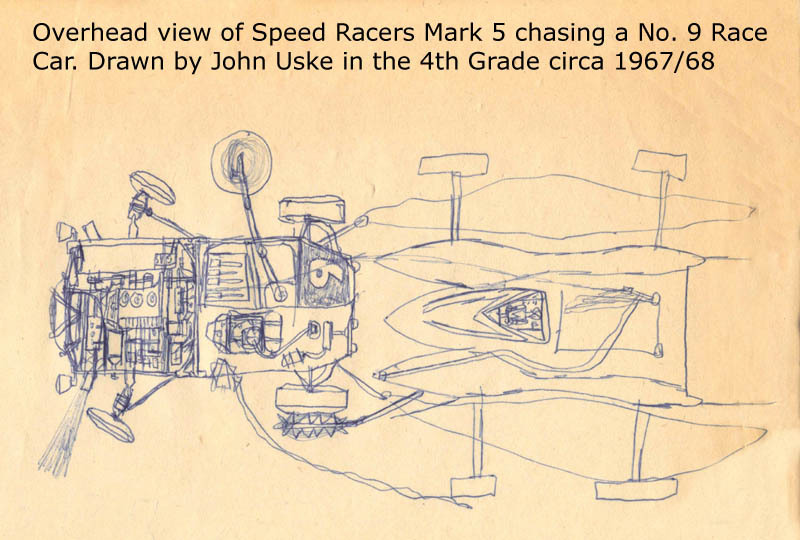 He raced cars for a living and the car he drove was the legendary Mark 5. What a car! It was truly awesome. It had spring feet for jumping and flying, a retractable canopy to convert to a submarine, and a host of many other gadgets that were all controlled from a group of buttons located on a keypad in the center of the steering column. Out of all of the Mark 5's gadgets the ones that impressed me the most were 2 giant circular saw blades that unfolded out from under the front of the car. Speed would activate these when needed to drive through forests so he could cut the trees down in front of him. I loved this car and drew many pictures of it. You can click on the thumbnail on the left to see one of them and also check out my early years section too. I have a detailed side view of the car there. Speed Racers cohorts were his girlfriend Trixi, his little brother Spritle who had a pet monkey named Chim Chim. His father "Pops" who designed the Mark 5 would be in some of the episodes too. Most of the times he was competing against Racer X whom unbeknownst to Speed was his missing older brother. Unlike Popeye I enjoyed every single episode of this cartoon series because the real star of the show was always the gadget laden Mark 5.